Nov. 12 Update: Australian authorities have arrested a 50-year-old woman in connection with a string of incidents where needles were inserted into fruit, sparking nationwide fears across Australia. CNN is reporting the arrest took place on Sunday in Queensland after what was described as a “complex investigation.” More than 100 cases were reported of needles or pins stuck into fruits across six Australian states. In an effort to quell this crisis, Australian supermarket chain Woolworths has made the unprecedented move of temporarily pulling sewing needles from its store shelves after, according to CNN, “at least 100 reported cases of the objects being inserted into strawberries nationwide.” It also pulled them from sales online. 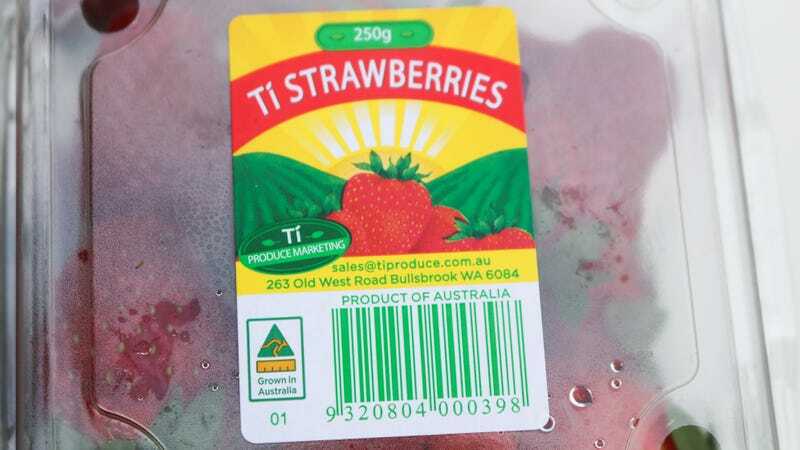 This all has horrible indications for the Australian produce industry, as “some buyers in Russia and the U.K. have also blocked Australian imports.” Sales of some strawberry brands have been halted across the country. The Australian government has also increased the penalties for such produce tampering, up to 10 to 15 years in prison. In the meantime, Australians are urged to slice their fruit in half before consuming to make certain they are needle-free. What a world. Ask The Salty Waitress: What should I do if I suspect a restaurant gave me food poisoning?